I've been pretty neglectful when it comes to blogging. I haven't had much going on here-- honestly, I've just been pretty lazy. 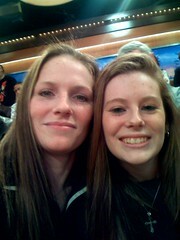 Last week I went to "The Morning Show with Mike & Juliet" with my little sister that is home from college. It's a pretty new show so it isn't really well known. It is on Fox (which is channel 5 in NY) & it's on a 9am (eastern time). We had a good time, it was nice spending time with her before she left again for school in Boston. I'm also planning on buying a new camera. I've been spending a lot of time on Flickr & have really fell in love with taking pictures. I have a FujiFilm S5100 & altho it takes good pictures (mostly good outdoor pics) I never want to bring it anywhere because it's so big & bulky. I want a camera I can have in my bag all the time & I don't like to carry huge bags. I also don't really know how to use it well, it is always set on Auto. I love electronics & I'm always getting bored with what I have--so what I am doing is selling my AT&T/Cingular Pocket PC with a few extras to pay for my new camera. Since I bought my iPhone I really have no need for it anymore, it has just been sitting there. This is really hard for me to do because I LOVE that phone but it is really silly for me to keep. The camera I am planning on buying is the Sony Cyber-Shot DSC-W80. I've posted in an Etsy forum & it seemed like the CyberShot is very popular, I also have a friend that uses a CyberShot. But what really sold me was the Camera Finder on Flickr. I'm really clueless about cameras so I wanted a point & shoot that's small, narrow, has a large LCD screen, takes good macro & indoor shots. After I figured out which cameras had those specs I look at the photos those cameras took--when I looked at the photos from the W80 I was sold. I also just listed another phone on ebay, a Motorola Razr V3. Maybe I'll use what I make from that to pay for the camera's memory card & any other accessories needed for it like a car charger & a screen protector. I haven't decided if I was going to sell my Fuji S5100, maybe if there is some other electronic I want! Well that's all for now. I'm off from work the next 2 days & hope to get some sewing done. I'm planning on having a new category in my etsy shop, Pet Clothes! I have a little Yorkie Shea & she needs jackets during the winter, I like to keep her hair short. I would also like to make another quilt for my bed. The fabric store around here is down sizing & it looks like they haven't bought any new fabric lately. I'm thinking of cutting up all my old scraps & making it into a quilt. I have so much I've saved & it continues to grow, I need to make some use of it & a quilt would be perfect. That's all for now.